Issue: Deluge Web-UI will not serve the webui GUI if BASE is defined via web.conf AND/OR via the console "deluge-web-debug.exe -base /deluge/"
Background: I've been dealing with this for a couple years. I've NEVER got it to work correctly. At first I thought it was my webserver, but I quickly found out that I couldn't even access the WebUI if I circumvented the webserver via locahost:8112/DELUGE . Setting base path in webui.conf AND running the console w/ -base defined. 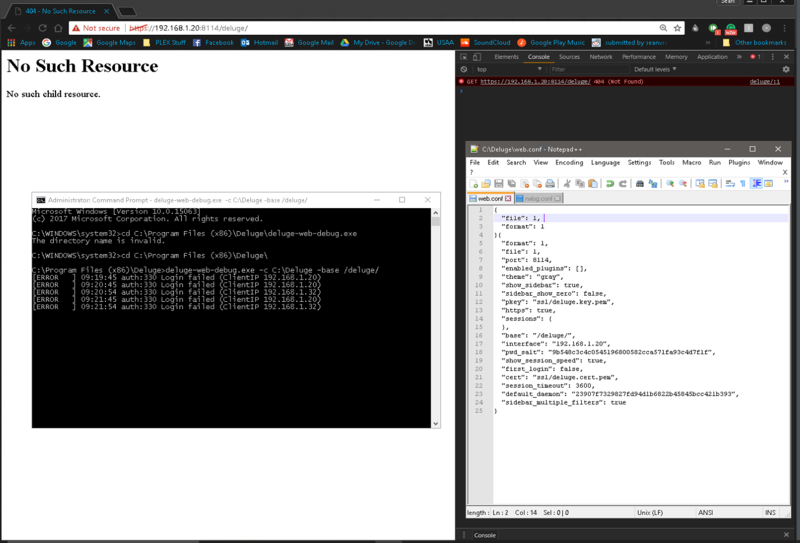 running console with - base defined and base defined web.conf as "" or "/"
no combination works. no errors in the console output, however, the webui is actually listening on port 8112. Suggestion: I'm assuming there is a problem with how python interprets the BASE input. There is probably a missing and/or outdated package that is needed. However, I have tested BASE path with several other python-based applications, such as Headphones, or PlexPy?, and they work. Hi, are you sure this isn't the same as ​2677? Yup, i saw this, but I don't understand what the fix is?